of Oceanography & Coastal Sciences). Humans are innately visual creatures, with half of our brains devoted to processing information through our eyes. As the saying goes, “A picture is worth a thousand words.” But the worth might increase if the picture provides more information about astrophysical activities, diseases, paths and damage potential for hurricanes, and other phenomena researchers only recently have gained the technologies to explore, especially after the advent of supercomputers. On the other hand, a bad picture can be worth a thousand bad words. It needs to be scientifically accurate and communicate the right content; looking good and colorful is not enough. Werner Benger knows the importance of a good picture and uses his expertise in supercomputers to accurately visualize complex issues. As an IT consultant and research scientist at LSU Center for Computation & Technology (CCT), he has been working on a project titled “Observations and Modeling to Advance a Louisiana Coastal Circulation and Oil Spill Prediction System” since fall 2012. The project’s objective is to investigate the fate of oil along the Louisiana Gulf Coast that spilled during the Deepwater Horizon incident in 2010. Funding came from BP through the grants to LSU and Coastal Waters Consortium as part of the BP Gulf Research Initiative. Benger’s specific area of interest is Barataria Bay south of New Orleans, a complex estuary connected to the Gulf of Mexico through four tidal passes. It contains several large lakes and numerous marshes interconnected by ponds and channels. 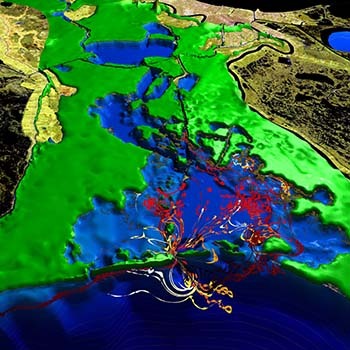 The project is a collaborative effort and is part of a larger initiative implemented by researchers at LSU Department of Oceanography & Coastal Sciences (DOCS) who are doing computational modeling on different aspects of the 2010 oil spill. “In simple terms, researchers from the LSU’s DOCS, namely Dr. Dubravko Justic, Lixia Wang, Dr. Nan Walker and others, make multiple geoscientific and model simulation data sets available to me, and I develop visualization methods to highlight features in these data sets that often allow us to see more than what was originally expected,” Benger said. “Simulations performed in our project predict that BP oil particles originating in open waters close to the Gulf’s coastline flow under tidal influence into the Barataria Bay estuary and some of them return back into the open water,” he added. The ancient art of cartography is an inspiration to Benger. His method of graphic rendering produces results similar to cartographic map views. This approach uses colors to represent ranges of elevation, known as hypsometric tints, and creates topographic contour lines procedurally as part of the rendering process. The use of hypsometric tints is said to have been invented by Leonardo da Vinci in the 15th century. To enable the graphic rendering process, Benger conceived enhancement techniques such as line smoothing, gradient compensation, contour line visibility fading, nonlinear elevation mapping, and shininess variation. All these enhancements were required for a pleasing visual result. On top of these cartographic data, Benger and his graduate students can display the oil spill’s trajectories. As shown on the image above, the particles’ trajectories start out in dark red, brighten up to light red, transitioning into orange and yellow as they age. They finish in white colorization at the end of their lifetime. The scientist employs the Vish Visualization Shell, a highly customizable framework he started developing in 2005 just before joining CCT. As a result, LSU oceanography experts were surprised to discover several new features that were not obvious to the research community before. “Also, the Barataria Waterway appeared in such clarity that we called it the ‘Grand Canyon of the Barataria Bay’ on first sight,” Justic added. As with any image, there is more taking place than meets the eye. Behind the beautifully colored image lie several days or even weeks of work, with visualization researchers combing through complex algorithms and reconciling differences, sometimes piece by piece, in large data sets to ultimately produce a picture of what the data is showing. “Initially, it took me some time to learn the new environment, but Dr. Benger gave me ideas, and as a result, we developed new tools that enhance visualization,” said Isaac Ayyala, an LSU master’s student studying electrical engineering who works as Benger’s graduate assistant. “Specifically, we developed color legends – numerical scales attached to color labels, like the explanatory legend on a cartographic map – and lights shining in different directions on the object to make it look more realistic,” Ayyala added. Another Benger’s graduate assistant, Neha Manya, who is studying computer science at LSU, became so excited about this visualization initiative that she is thinking of making it her graduate project. “Usually contour lines are computed as a set of lines, which is quite complex,” she said. Supercomputers have revolutionized scientific and engineering methodology. They enable researchers to explore theoretical models of phenomena that are either too dangerous, too vast, too tiny, too expensive, or simply impossible for laboratory experimentation. CCT’s Werner Benger is at the forefront of bringing scientific visualization into the supercomputing revolution.